Rathmines Park, Styles Point Reserve is the location for Lake Macquarie’s first Disc Golf course. The best address to use to gain access to the park is 2 Overhill Road Rathmines, which puts you right outside the entrance to Styles Point Reserve. The course was installed in August 2014 with Innova Discatchers as baskets thanks to the hard work of Neil Roberts and generous donations from the disc golf community . If you walk around Styles Point reserve you will see their distinctive yellow bands throughout the park. Shortly after the course was installed it hosted the Australian National Disc Golf Championships in November 2014, with an additional 9 holes being played on the East side of the park to temporary baskets. The public course layout is a short yet interesting course for just about everybody. 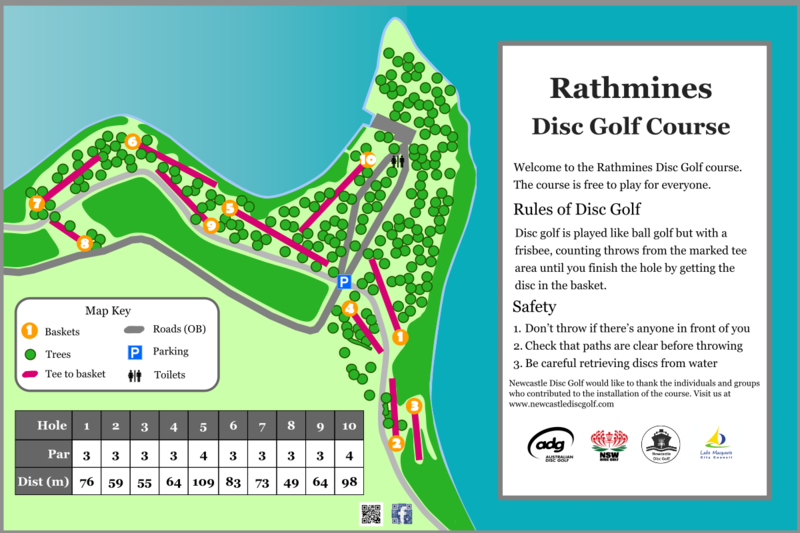 Rathmines Park is a Par 32 course across the 10 basket layout with mostly par 3 and two par 4 holes. The tees are marked with tee signs and pavers in the ground. Some may be missing, but most should be intact. There are also arrows at the pins, pointing to the next tee and a course map near hole 1 and the parking area.